Its all about the quick fix…. So last night’s little thought process ended down the line of the quick fix following on from an “ask RT” show Ross and I had done earlier where they were mentioned, and I started to draft a little blog in my head as I found it quite an interesting concept. You lose the weight fast by shocking and starving your body, you go on your holiday or whatever else and you put the weight straight back on when you start eating normally and more often than not you put on that little bit extra because you’ve gone to town on your all-inclusive food and drink. I hear about these detox plans, these 6 week plans, etc. 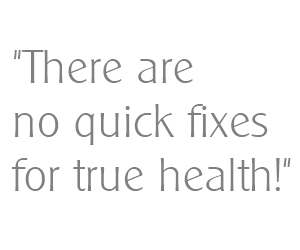 and it pains me that people are so desperate for the quick fix that they are playing with their health! We run a 28-day program, we advertise it as a 28-day program, because this is what we have to do, this is what people respond to… they don’t want to hear that to lose 3 stone (sustainably – i.e. to lose it and keep it off) you’re looking at 32 weeks’ worth of training and balanced nutrition, maybe a little/lot less depending on what your previous training and eating habits were. Those who lose just a few pounds in that time have achieved EPIC results too because they’ve found a way to balance their nutrition and track it in such a way that they can do it FOREVER, not just a few weeks, so even long after they leave us they’re still on their way to achieving what they want to achieve and keeping it that way. My cousin is a perfect example of someone who has taken a healthy and sustainable approach… she hasn’t been able to train so she has literally done it all via her nutrition, she has changed her eating habits and in 1 year she has lost 6 stone 7.5lbs!!! I couldn’t be prouder of her, this weight is weight that will change her quality of life and it will STAY off because she hasn’t starved herself to get it off quickly… she’s been sensible about it… she hasn’t swayed to the quick fix, her health has been put first!! !